Home→Blog→Blog→Could biochar roof tiles be coming soon to a roof near you? 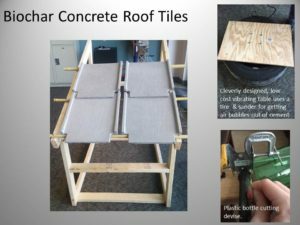 As the college year comes to a close the RIT senior design team focusing on biochar based roof tiles that I have been working with is showing some exciting results. The team was tasked with coming up with a tile design as well as a biochar-concrete recipe which could be tested on homes being built by the 4 Walls Project in El Sauce, Nicaragua. Each house is typically built by volunteers, family members of those receiving the house plus one skilled home builder and measures 6 x 6 meters. Currently the zinc roof is one of the more costly parts of the house ($400) and is one of the few parts that cannot be sourced locally. Zinc roofs are also loud when the heavy rains come and they conduct heat way too efficiently making the homes uncomfortably warm on hot days. The challenge for the team was to design a roof that was cheaper, quieter and more insulating than the current roof. Preferably they would design one that could be made locally thereby creating local jobs and spurring economic development, something which is sorely needed throughout the region. While some testing still remains to be done, the design of the tiles has been finalized and the first several prototype tiles have been cast (see picture above). The results are far more impressive than I think any of us were expecting! The recipe chosen for the current batch includes roughly 30% biochar by volume (10% by weight). Cement, sand and water make up most of the rest but the students sprinkle in some magic pixie dust – in the form of shredded plastic from soda bottles – to lend the tiles more strength. The team even designed a handy little device to turn bottles into string – yet another possible job for locals in Nicaragua! Each tile contains roughly ½ of a 2 liter bottle’s worth of plastic. A plastic mold was created for the tiles with a wood-like finish on the sunny side of the roof. Current cost estimates put the entire roof at less than half the price of the zinc roof. Although a realistic price on biochar has yet to be assessed, the amount of char needed could likely be made in one day using 1 or 2 Kon-Tiki soil kilns so in a place like Nicaragua where the cost of labor can be as low as $5/day, the cost of biochar would be negligible. Plastic bottles are a nuisance, so putting a nominal fee on collecting them could go a long ways towards keeping them from cluttering up the landscape while also providing a steady stream of raw material for tile makers. The students will be debuting their roof tiles May 7th at Imagine RIT! – the heat recovery team will also be showing off the tricked out Kon-Tiki as well!